Park just past the west end of the Wawona Tunnel at the start of a long stone wall. Cream is located down below the highway on what would be climbers left of a buttress that incudes Jam Session and Energy Crisis. 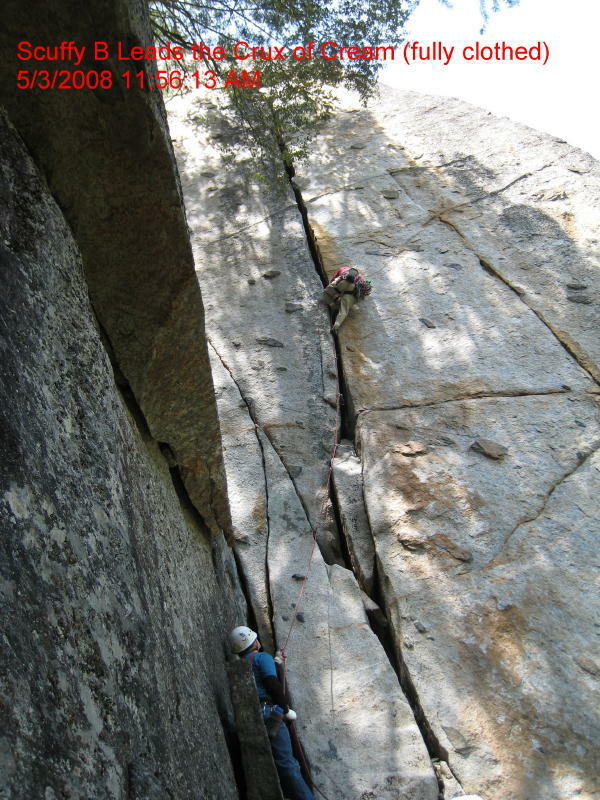 The easiest, yet still kinda hard, way is to rap into Cream and leave a fixed rope down the moss covered slabs above the Cream bolt anchors so you can get out of there after doing the route. Pro: to six inch says the book. Here is what I took and listed in order of use by inches: (cams) #2, #2.5, #3, #3.5, #4, #4, 5" tube, 5.5" tube, 6" tube, #6 cam. Bring a couple of slings and there used to be a fixed pin up near the top. The crux of this route is low down where it goes from fist to patella jam size. This route is more technical than burley, even though I think it is overhanging most of the way. Once you get going, your leg will be in it most of the way. Billy Russell did get his knee stuck in it when we did the route and it took about 15 minutes to extract him. At the top of the route there is a two bolt belay, and probably pretty manky by now. If you left a fixed rope tied to a tree, back your anchor up with this. 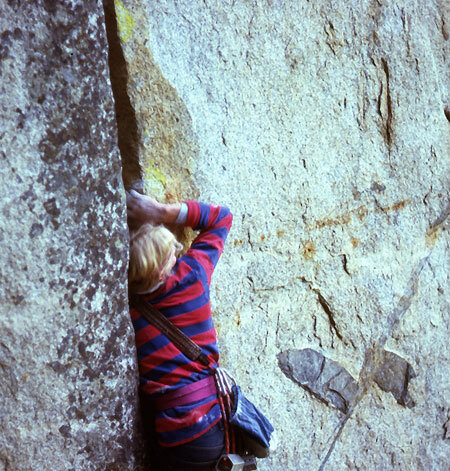 We had no fixed rope and the face moves up the mossy slab was probalby the crux of the day. Pretty sketchy! Will writes: Finding the top of the cliff itself is not trivial. I got beta from Mike Schaefer a few days before we went and it helped alot. The best piece of beta was to get down to the major powerline (there is a feeder line running more perpendicular to the valley...you want the main larger line running more parallel to the valley with all steel power poles.) You can follow the smaller power line which start very close to where you leave the car, and uses live trees as some of the "poles", down to the clearing where the main line runs. If you've ever noticed the big lines coming down the valley wall into the Generator Station, those are pretty close to the crag. When you reach the power lines, you're looking for a pole with some scratching in the paint. A big "+" , a faint arrow, and "energy crisis" or "cream" (can't remember which) scratched in. When we were there, we went to the wrong side of the cliff top first. The cliff is bookended with "square cleft gullies" which are fairly obvious when staring down them, one on each side of the crag maybe 150 yards apart. The one on the skier's left had a highline with green webbing crossing it as of mid summer. DO NOT attempt to descend here. You will cliff out and/or die. Descend the one skier's right. No trail to speak of and the descent gully looks a little improbable. The most beaten in path in the area goes to the skier's left side of the highline. as far as the first metal power pole. You want the next one. I tried various other options because I'd seen a couple cairns. looked around more, finally found the right gully which was obviously travelled, to my eye. That takes you right down to Cream. you directly to the key power tower. I mean, if I followed my nose I would get there. Saves probably 2 minutes over the easiest way.